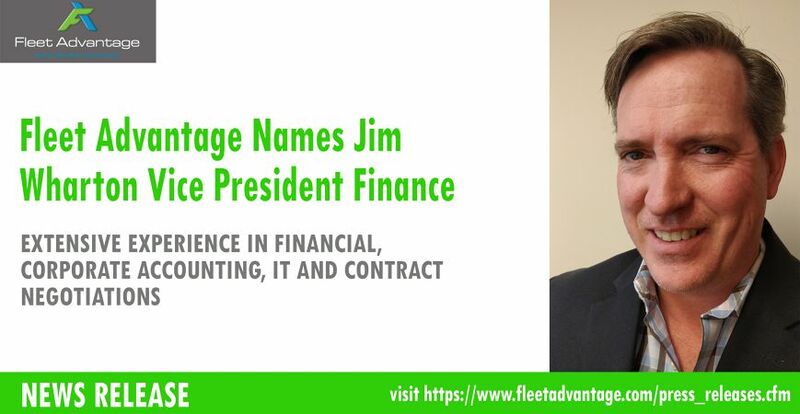 FORT LAUDERDALE (January 15, 2019) – Fleet Advantage, a leading innovator in truck fleet business analytics, equipment financing, and lifecycle cost management announced it has hired Jim Wharton, CPA, as Vice President, Finance. Wharton’s background includes extensive experience in financial and corporate accounting, financial planning and analysis, as well as ERP implementations. Prior to Fleet Advantage, Wharton was the Director of Finance for Steiner Leisure Limited in Fort Lauderdale, where he oversaw all accounting functions, purchasing, human resources, information technology, as well as managing the company’s real estate and operational systems. Wharton was instrumental in managing all accounting functions, as well as financial planning and analysis, budgeting, forecasting, contract negotiations, auditing processes, and financial elements during acquisitions. Wharton also held accounting and financial positions with companies such as Arthur Anderson, Lennar Corporation and Chancellor Beacon. Wharton is a graduate of the University of Miami, with a bachelor’s degree in business administration, accounting. He is also an active CPA of the State of Florida.